German footwear brand Birkenstock has had enough with fakes flooding onto Amazon’s online marketplace and the lack of anti-counterfeiting enforcement, announcing it will be “terminating” its business relations with the e-commerce giant. From 1 January 2018, “Birkenstock will completely discontinue direct deliveries provided by the US online retailer’s Luxembourg-based European subsidiary [Amazon EU S.à.r.l. 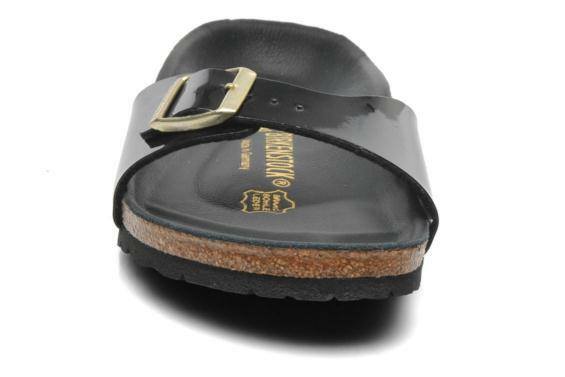 ],” the shoe manufacturer said in a statement, noting that the decision applied to the full Birkenstock product range. Birkenstock has already cut ties with Amazon in the US. The sandal maker said that consumers were being “misled” by counterfeit products offered for sale on Amazon’s EU platform and that there had been a “breakdown in trust” between the two firms. Birkenstock claimed there had been “a series of violations of the law” on the Amazon platform where the company’s trademarks were infringed, and consumers were being misled regarding the origins of the products. On a number of occasions, Birkenstock said it had lodged complaints about poor-quality counterfeits being sold online, implying that the response from Amazon was inadequate. The company alleged that Amazon had “failed to prevent” fakes from infiltrating its marketplace – and, indeed, Birkenstock was surprised at this slapdash approach to business. “Putting the issue of legal obligations aside, Birkenstock is of the opinion that an integral part of a trusting business relationship is that, upon first being notified as the operator of the marketplace platform of such a breach of the law, Amazon would, of its own accord, do everything within its power to prevent this type of and similar infringements,” the footwear manufacturer said. Amazon has not made any comment on the news. Birkenstock’s relationship with Amazon has been a rocky one. In July last year, the sandal maker decided to stop supplying stock to Amazon in the US, over claims the online retailer wasn’t doing enough to halt the sales of counterfeits and that it was proving impossible to police the fakes. Reports suggested it was intending to prevent third-party retailers selling its products via the site as well. But in July, Birkenstock rounded on Amazon again, this time targeting a new programme to buy products from third-party merchants, which the firm saw as an attempt to bypass uncooperative retailers and seek a “back-channel” to obtain the brand. Bloomberg reported that Birkenstock had sent an email to authorised retailers warning them not to drop their prices for the online marketplace and outlining the prohibited resale agreement they have with the sandal maker. Amazon has come under increasing pressure of late to crackdown on counterfeits being sold on its platforms, especially as it attempts to woo big brands. Amazon’s measures to stamp out counterfeits have been something of a sticking point for some, however. In October, it was reported a potential deal between Swiss watch company Swatch and Amazon had stalled after discussions over policing counterfeits on the marketplace had reached a stalemate. By all accounts, Swatch had sought a written commitment from Amazon to “proactively police its site for counterfeits and unauthorised retailers” but the tech giant had refused, causing progress on a deal to ground to a halt. Where there has been success was the reports in June that claimed sports shoe brand Nike was partnering with the marketplace to sell shoes directly to consumers via Amazon’s anti-counterfeiting brand registry programme. According to reports at the time, the agreement would see Nike taking greater control over how its products were sold online to make sure knockoff shoes weren’t offered by third-party sellers, while Amazon was required to be more ruthless in its efforts to rid the site of counterfeits and dodgy vendors. Amazon’s current process for kicking off knockoffs is rather flexible with the onus on brands to inform the e-retailer of the fake goods before they can be removed. Yet, despite being booted off, the counterfeiters can easily jump back on under new accounts with slightly different details. Under the new brand registry programme, the registration process would be stricter, requiring sellers to register with Amazon and prove they have the brand’s permission to sell the brand-name goods online. The programme also provides brand owners access to tolls such as machine learning to detect fakes and prevent bogus products being listed.